Keep the Shema Israel at your right hand with this simple, elegant silver bracelet from Jerusalem-based Israeli jewelry designers Emunah Jewelry. 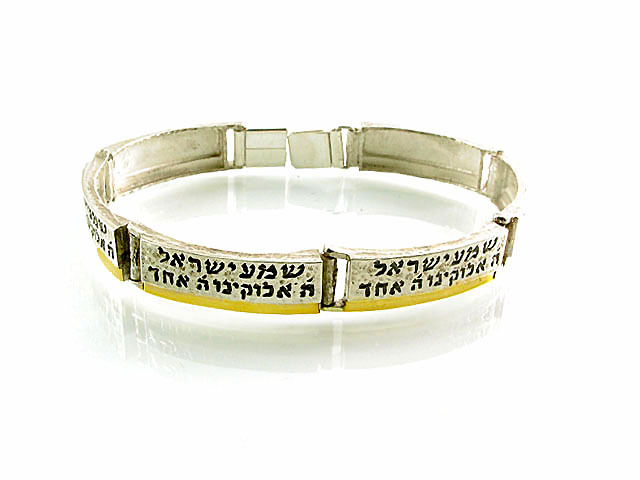 The bracelet, crafted from 925 sterling silver, is formed from horizontal rectangular panels engraved with the Shema Israel prayer and linked together. The silver bracelet is elegant but basic enough to fit any taste and will appeal to people who appreciate clean, unembellished Jewish jewelry. Give this to a beloved friend or family member, or wear it yourself. Jewelry also makes a wonderful souvenir of a visit to Israel, or a gift for anyone back home who hasn't yet visited.